Designed to provide security protection for GPS delivered position, navigation and timing (PNT) data, the BlueSky GPS Firewall solution can be deployed in-line between any standard GPS antenna and stationary GPS receiver to provide protection against GPS signal incidents, both intentional or accidental, before they enter a GPS receiver system. In response to the growing number of GPS incidents and their potential threat to critical infrastructure, and to assist customers in rapid adoption, Microsemi is making BlueSky GPS Firewall Evaluation kits available in advance of the full production release of the solution. The dependency on PNT is increasingly important to critical infrastructure sectors such as telecommunications, energy, transportation, emergency services, financial services and enterprise infrastructure, and is mainly provided through GPS. Published best practice documents by the Department of Homeland Security (DHS) Science and Technology Directorate (S&T) describe steps that can be taken to mitigate outages and disruptions with GPS reception. In alignment with these documents, the new BlueSky GPS Firewall provides critical infrastructure sectors with a first line of defense against GPS threats to help build out a secure, robust and resilient PNT platform for their infrastructures, according to the company. 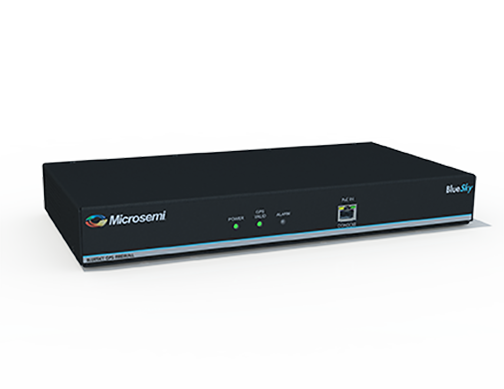 Microsemi’s BlueSky GPS Firewall filters the GPS signal in real time, removing anomalies from the GPS signal before it is consumed by the downstream GPS receiver. This creates an intelligent and secure barrier against jamming and spoofing, and prevents the GPS receiver from being impacted by such incidents. Deployment of the BlueSky GPS Firewall does not require any new cabling or alteration of the pre-existing antenna installation and is interoperable with standard GPS receivers. Additionally, the BlueSky GPS Firewall incorporates an Ethernet interface for remote management and monitoring and includes a secure web interface that any browser can use for configuration and set-up of the device. The BlueSky GPS Firewall includes a broad range of data validation rules based on real, live sky GPS threats, both intentional and unintentional. Similar to network security threats, new GPS vulnerabilities are on the rise and Microsemi is continuously tracking GPS signal manipulation including spoofing threats, jamming attacks, multipath signal interference, atmospheric activity and many other issues that can create GPS signal anomalies, disruptions and outages. These advancements are incorporated into the software platform of the BlueSky GPS Firewall, which can be updated remotely using Microsemi’s TimePictra management system. According to the GNSS Market Report, Issue 5, copyright European GNSS Agency, 2017, professional market segments such as maritime, rail, telecom/utility/enterprise, surveying, aviation, agriculture and drones which use GNSS devices to operate their infrastructures, enable billions of people globally to benefit from them on a day-to-day basis — whether by enjoying the produce of sustainable and cost-effective agriculture, by using efficiently coordinated transport networks, or by leveraging on GNSS-synchronized telecommunications networks. The total installed base of GNSS devices in these professional segments was estimated at 14.4 million units in 2015 and is expected to grow to 97.8 million units by 2025. Microsemi’s technical experts will be showcasing the BlueSky GPS Firewall, along with its full range of timing and synchronization solutions including the latest advancements in atomic clocks, timescale solutions, and PTP and NTP server systems in Booth: 116 at the 30th International Technical Meeting of the Satellite Division of The Institute of Navigation – ION GNSS+, Sept. 25-29.